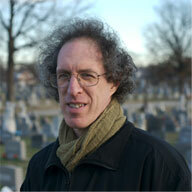 This week on Fieldstone Common our featured guest is Steve Luxenberg, author of the book Annie’s Ghosts: A Journey Into a Family Secret. Annie’s Ghosts was named to The Washington Post’s Best Books of 2009 list and was honored as a Michigan Notable Book for 2010 by the Library of Michigan. It was featured on NPR’s All Things Considered and on the Diane Rehm Show. Other media coverage included articles or reviews in Parade, The Washington Post, The Baltimore Sun, The Detroit Free Press, The Detroit News, the Buffalo News, the Jerusalem Post. Steve is a graduate of Harvard College. He grew up in Detroit. He and his wife, Mary Jo Kirschman, a former school librarian, live in Baltimore. Newly selected as a Great Michigan Read 2013-14 and a Michigan Notable Book for 2010. One of the Washington Post Book World’s “Best Books of 2009,” Memoir. Trade Paperback; 432 pages; with list of recurring characters, end notes, index and some BxW photos. 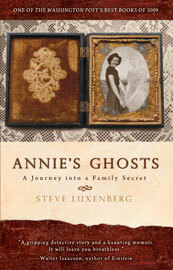 Annie’s Ghosts: A Journey Into a Family Secret is available for purchase from Amazon.com and other booksellers. Steve and I talk about the decision behind prying into a family member’s private life, which they’ve kept secret, after they’ve died. We talk about identity – our own identity and other people’s perception of that identity. We dig into the topic of secrets and whether they should be kept or released. And, of course, we dig into the big secret in his family, that his mother had a sister, despite claiming all her adult life that she was an only child. Steve did much more than a reasonably exhaustive search for the research behind this book. His investigative skills and tenacity are a real lesson and inspiration for any historical researcher. One copy of Annie’s Ghosts: A Journey Into a Family Secret was given out to the Fieldstone Common audience courtesy of Hyperion Books. Congratulations to our winner and thanks to Hyperion Books for their generosity in donating the book! 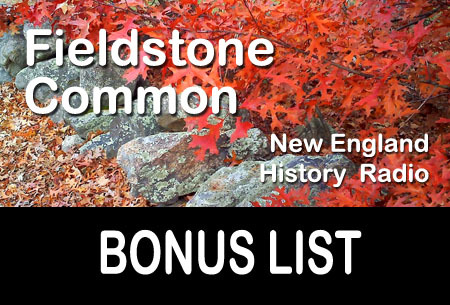 Question: What’s that’s new stuff in the Fieldstone Common title (FC 82)? Answer: That makes it easier, especially for iTunes and other podcast listeners, to keep track of which episode they are listening to. FC stands for Fieldstone Common and 82 is the number of the episode.